You guys have been assisting me on and off with my X-Cart for years now. I have always found your mods to be of the highest stanard, and strongly prefer them to those from any other company. Additionally, your prompt, professional and friendly support is second to none. Thanks for your continuing support, and keep up the great work! NEW! Customize the pagination of categories, manufacturers and/or xcms categories (page 2, page 3, page 4, etc.) for increased indexing and prevention of duplicate content warnings. CDSEO also includes a full featured XML SiteMap Generator which generates an XML SiteMap in just seconds! CDSEO Pro for X-Cart is the definitive x-cart seo tool. Created from over seven years of hands-on x-cart seo experience in addition to feedback from the top x-cart search engine marketing firms, CDSEO Pro creates a search engine friendly structure while providing the ability to seo optimize your category, product, manufacturer, and static pages. CDSEO Pro is the greatest thing to happen to X-Cart seo - EVER. 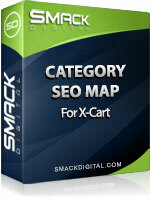 All other x-cart seo solutions have been flakey in comparison. CDSEO Pro is an absolute blessing and an answer to the prayers of anyone who has ever attempted to optimize x-cart for the search engines. ... all using an integrated administration control panel! CDSEO Pro is the only x-cart url mod that functions as a complete seo solution! Optionally allows replacement with full http domain, i.e. href="http://www.example.com/url/" instead of href="/url/"
Automatic 301 redirects from default php urls, html catalog urls, and/or x-cart clean urls. Cronjob supported - setup once and it will keep itself updated! Nearly all apache hosts provide mod rewrite, while isapi rewrite for windows can be downloaded. XML Sitemap does not generate multiple sitemap files often required for sites with more than 50,000 products.